(Round, 48" x 48" , 122cm x 122cm). Framed dimensions: 50" x 50". Provenance: Current owner purchased c.1995 from First Peoples Gallery in Silverthorne, Colorado. "The Gods insure us in this world of the beginning that we must first understand the first world and the journey in the first world before entering the next three worlds. The Sacred Deer will lead the Shamans on their visionary pathway to teach and gain knowledge. On this journey of learning, the Gods and the Shamans will teach us the meaning of Knowledge and will show us the door to enter the next world. In this first world represented by this round painting using the colors of symbology and the signs to teach the viewer that the journey starts and ends with the Sacred Deer and the Guides and Shamans teaching us, as we travel on this mountainous journey. The Scorpion helps the Shaman to repel evil and bad luck that may come his way during this journey. On this journey the Gods teach power, visions, enlightenment to the people." This excellent book was published in conjunction with the University of Pennsylvania Museum exhibit Mythic Visions: Yarn Paintings of a Huichol Shaman. It focuses on the work of José Benitez Sanchez, with a good introduction to Huichol culture and art as well. 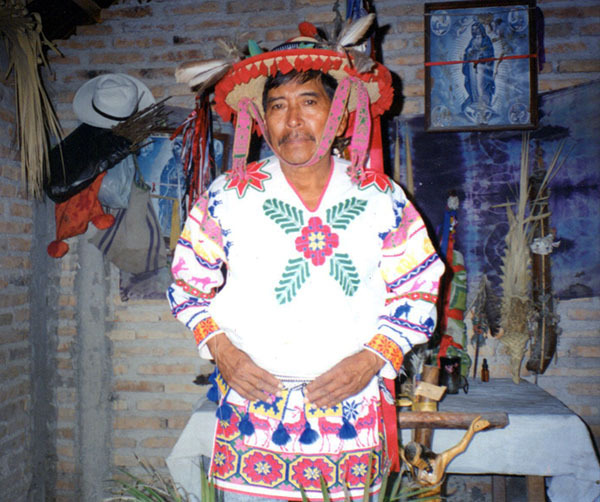 Comunidad Indigena de Zitakua, Nayarit, Mexico, c.2000. (24" x 24" , 61cm x 61cm). Signed on back by artist in Spanish and Huichol, with written description in rather difficult to follow Spanish. Current owner purchased in Puerto Vallarta from Roberto Flores, c. 2000. Text in Spanish with complete English translation. Edited by Johannes Neurath with essays by Margarita de Orellana Johannes Neurath, Tutkila, Olivia Kindl, Guadalupe Gonzalez Rios, Juan Rios Martinez, Juan Negrin F., Jose Benitez Sanchez and others. 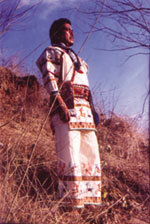 Huichol Artist/Shaman José Benitez Sanchez (photo courtesy of Enrique Peraza). Benitez was the subject of Mythic Visions: Yarn Paintings of a Huichol Shaman, the dazzling 2003 exhibit at the University of Pennsylvania Museum of Archaeology and Anthropology. The paintings reflect the visions of Huichol shamans - Huichol history and mythology and especially the peyote-inspired visions through which they believe they can communicate with the deities to heal themselves and their world. At Indigo Arts we have featured the work of José Benitez Sanchez and other Huichol artists for many years. In October and November 2005, Indigo Arts showcases this work with the exhibition Visions to Heal the World (October 7th to November 27th, 2005). 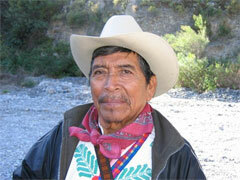 José Benitez Sanchez was born in 1938 in the settlement of San Pablo, where his father was a famous mara’akáme. Benitez credits his own path as a shaman to a revelation following an illness when he was fifteen, after which he set off on his first pilgrimage to Wirikuta. Benitez pursued the dual paths of shaman and artist almost from the start, and has been recognized as a master since the 1970’s. He pioneered a style of fluid figures in compositons which are dynamic, complex, and colorful to the point of being psychedelic. His success as an artist coincided with his growing stature in his own community. He helped found the indigenous community of Tsitákua, and was elected its first tatoani, or governor. Benitez’ work has been exhibited world-wide, and is included in many private and public collections. In addition to the substantial collection which was exhibited at the University of Pennsylvania his work is included in the collection at the UCLA Fowler Museum of Cultural History. We regret that José Benitez Sanchez passed away on July 2nd, 2009.